"There is a stiff, overly contemplative vein in literature that connects the worlds we find in books to leisure. How many novels give us characters who apparently don’t do anything? How many poems seem to emerge from a visit to a first-class resort? Literature of a different vein, however, rewards the reader with a hands-on grasp of the world as it is on the ground—characters do things with their hands, they touch tools and machines, they take the laundry from the line, they weed the garden, they bend their bodies to a task. In short, some literature gives us a world where people actually work. Some work, indeed, is drudgery, but some work leads us unexpectedly to beauty. Some of the work we do is a sign of love. The love that comes from work—from work of all kinds—is the force I find most palpable in this moving and wholly alive anthology. Sometimes that love is stern, sometimes it goes unrecognized, but there it is in the world, like two fingers pinching a clothespin, or a voice singing with the song of a shovel. We need love to wear its work clothes now and then, and I’m glad we have ALL THE LIVELONG DAY to remind us." 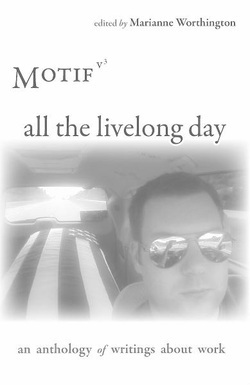 For more information about this anthology, visit MotesBooks. 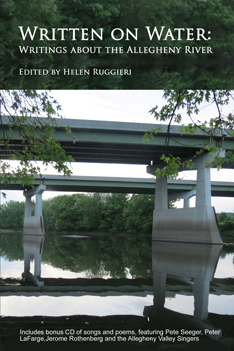 Three poems appear in Written on Water: Writings about the Allegheny River (Mayapple Press) edited by Helen Ruggieri and Linda Underhill. Other poets included in this anthology are Maggie Anderson, Julia Kasdorf, Carol Newman, Ed Ochester, Doug Ramseck, Liz Rosenberg, and Philip Terman. "If a river is a poem, and I think that it is, the Allegheny is a special one, for all the reasons captured in this collection of fine work. The writers here explore the kinds of life and sustenance a river provides, physical and spiritual. They capture the tensions and connections between the human and natural worlds where they meet in moving water. The range of voices here is wide, and surprising, like a river surprises—fast, slow, high, low, changing from day to day. Like a poem, a river sometimes seems random, but it takes us on a journey, as this book does. More than anything, these poems capture the magic, the mystery and beauty, the plain rightness of rivers." For more information about this anthology, visit Mayapple Press where you can find this collection as well as other books by some great poets!